Congratulations to you and your team in getting your object named, however it is pronounced. Its kind of a cute name. Much better than Glenn Seaborg's Pu (pea you) for plutonium. I am re-reading your April 2004 Physics Today article on the Kuiper Belt and have a question. MikeMike, mediary to the procreation god? Since my last name is McKay, I think I'll tell me new grandnephew that it's pronounced McKay-McKay. After all, what's the point in being an uncle if you can't fill the kids with sugar and misinformation before handing them back to your kin? I also believe "if you can't be a grand-father, be a great-uncle"
sorry to be frank, but the repetition in the name is definitely a plague. The reactions from laymen are at best amused, at worst irritated. 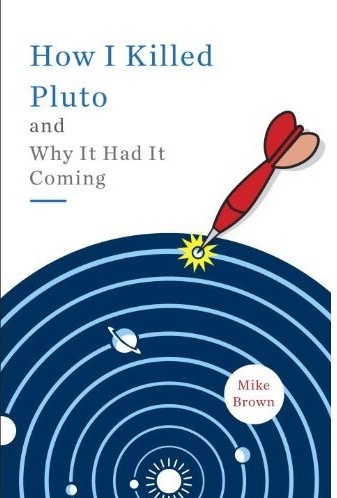 The most painful consequence seems to be a distanciation with the dwarf planets in general ("that should not be that important given that they do not even care giving them serious names" sic). I scanned through Hawaiian mythology. Please reassure me. The only embarrasing names I could find were Papa (because of the familiar connotation in all latin languages) and Kapo (because of WWII). Please tell me you have not picked them for EL61 or its moons. The grandnephew is still in the oven, so I'll have plenty of time to corrupt him. Since my name is Scots, it should be spelled Mackay and pronounced with a long I (muck EYE). But since I live in the states, it's long since been Americanized in spelling and pronunciation (muh CAY). About the repetition in the name: I think that you, Mike, have chosen a good name - and easy to pronounce for everybody. Though speakers of European languages consider repetition sometimes to be a typical feature of "childish language", it is actually a normal feature in Polynesian languages. And you can find examples for repetitions in Japanese as well as in old Indoeuropean. Let us have an open mind and respect holy names of foreign deities - actually I have no idea how ridiculous "Jupiter" might sound to Rapanui laymen. Indeed a repetition looks childish in European languaages. That is a fact. Jupiter may sound ridiculous to RapaNui speakers but I'm sure they have/had a proper, adequate name for Jupiter in Rapa Nui (maybe MakeMake btw, or not a god's name at all, in any case not somthing they made fun about). The Chinese and the Japanese have their own pattern for naming planets, as all other cultures, and all deserve respect. Respect is an issue indeed: I do not find that naming the 19th largest object so far in the Solar System after a major deity is so respectful for the concerned cullture: that leaves the dominant planets with Greco-Roman names, and smaller ones with non-Western names. Let's not be arrogant with non-Westerners. The name selection should stand for Western languages. 2005FY9/Makemake being the 19th or so largest object, it was too small in my opinion to be named after a MAJOR non-Western deity (as it beleaguers the concerned culture) and too large to be named without solemnity. It's really a pity that this contributes to downgrade the standing of these planetary objects. Now it's done. Maybe (maybe) as Mike said there is nothing splashy about MakeMake, and it will go into oblivion. But EL61 is another story. Please please Mike, avoid Papa and Kapo. I'm afraid it's really game over for this object. ("what's in a name!" - sigh). * in arabic there is no phonetic distinction between "AY" and "AH" except for the duration and the intonation, leaving Makemake sound like Makkah-Makkah. So I fear the worst. And I really hope Mike has not picked Papa. In case somebody wanted to know: in the Kantonese Wikipedia now the characters "horse-riding, horse-riding" have been chosen to phonetically represent the sound of "ma-ke-ma-ke" - in Kantonese. The choice of the appropriate characters for Mandarin pronunciation is still open. Now the Mandarin version of Makemake is there: rather than a phonetic approach they prefer to translate. So after "Xi-shen-xing" (= quarrel-god-star = Eris) we have now in Mandarin "Niao-shen-xing" (= bird-god-star = Makemake). To Elmar: good news that the name has escaped the ridicule in Mandarin. Maybe the Chinese will one day explore it and this object may not be lost for science finally. Btw, this fully illustrates what I claimed: in Chinese the naming pattern is consistent among all planets (full or dwarf). First this means we should in no way try to name them with universal arrogance but only for Western languages. And second the Chinese naming helps considerably to raise the standards of dwarf planets. Unlike in the West where silly-sounding names like Makemake contribute to belittle the scientific importance of these objects. Would you please list your source for naming Makemake? Was this a question to Mike for the Rapanui sources to name his dwarf planet "Makemake", or was this a question of where to find the Mandarin naming of "Makemake" ? In case the question is about Mandarin, you may look to various Chinese astronomy sites, as well as simply into Chinese Wikipedia: go to English Wikipedia "Makemake (dwarf planet)", then click on left on the language "中文" (Chinese), then you see the article, in which the text starts with the Chinese name "鳥神星" (= bird deity star) of Makemake. I'm interested in what he referenced...and how it was verified. Hi there, for the next Dwarf planet I'd like to suggest Dagda the Celtic father god who is also a fertility and resurrection god. It was great to stumble across a blog like this from someone active in discovering new TNOs or new satellites (even if they are really small). Regarding 2003 EL61, I understand not wanting to leak the name before it gets approved because if it gets out beforehand, it might get rejected and then leave you with egg on the face (well, it does look a bit like an egg), but can you give those of us who are eager every time a new body is discovered or named a little clue, like what culture's mythology you had in mind for 2003 EL 61? What is the adjective form of Makemake? Would future scientists refer to the features of "Makemakean geography" for example? Or would they refer to the features of the "geography o Makemake"? Using the Polynesian attributive form with "... o ..." is going too far - every language has the right to apply its own grammar to imported words. English however incorporated so many different patterns of adjective forms that it is now hard to tell which one the "real English" ways is - is it the Romance style "Makemakean" or the more Anglosaxon style "Makemakish" ? Or would you prefer a more classical approach like "Makemakical" or just leave it "Makemake" and use it as an adjective ? What is a problem with every imported word in English does not need any discussion in many other languages. If e.g. the Esperanto name of Makemake should be "Makemako" (as it probably will turn out, because all nouns in this language end with -o), then it would automatically be clear that the adjective form is "Makemaka" and the adverbial form "Makemake" (= "in Makemakean way"). I heard that 1996 TC 36 turned out to be a triple system, in which two larger primary bodies are very close to one another, and the third one circles around the other two like a moon. Do you know whether this is now believably confirmed or not ? And what about the magnitude changes of Makemake - could it also turn out to be some kind of multiple system ?? The dwarfish planet 2003 EL61, could be baptized as Megera, and your satellites with the names of other Erinyes: Alectus and Tisiphone!!!! Actually, Mike, I wonder if you didn't simply fall back on English. Final unstressed [e] ("ay") in foreign names regularly becomes [i] ("ee") in English. Consider "ukulele", which very few people pronounce with a final "ay" vowel. Same with "sake" (rice beer), "karaoke", etc. "MAH-kee-MAH-kee" (US) or "MAK-ee-MAK-ee" (UK) is the fully anglicized pronunciation, like the Maori tree name ake-ake. Some people will want to strive for a more authentic pronunciation, just as some people pronounce "ukulele" with a final "ay" sound and some astronomers pronounce the moon Io "EE-oh" rather than "EYE-oh", but neither is wrong.